The name Matusadona trips operatically off the tongue but the park takes its name from the Matuzviadonha Hills – and their name means ‘falling dung’! Like so much opera, not quite so romantic in translation… Having said that, Matusadona is splendidly romantic. It takes a lot of getting to, especially these days. There are still a couple of luxury lodges operating private concessions on the fringes of the National Park. but many of the old lodges have been mothballed while waiting for tourism to revive. Most people fly in or take a boat from Kariba town. It does stay open all year, but the access roads are extremely ropy (4x4 is required). Once there, the best thing to do is a walking or canoe safari or take to the waters of Lake Kariba on a cruiser or houseboat. 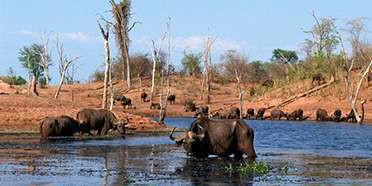 The national park covers 338,000 acres (1370 sq km) along the southern shore of Lake Kariba, between the Ume River in the west and the Sanyati River in the east. The wide foreshore changes size dramatically from year to year as the level of the lake rises and falls, according to the rains and flood levels. Behind this is a belt of mopane woodland and behind that soars the 600m (1968 ft) Zambezi Escarpment. Many of the animals here are descendents of those rescued in one of the most ambitious and heart-tugging translocation programmes in history. Operation Noah was a race against time to rescue the animals stranded on shrinking islets as the rising waters of Lake Kariba flooded the Zambezi Valley. Working against the clock, rangers and volunteers ferried thousands of animals large and small to the safety of the shore, leaving only the eery drowned forest poking its wizened branches from the waters of the lake, as favourite perch of the African fish eagles. For me, its sculptural quality is breathtaking, a photographer’s dream. The range of wildlife here is great with black rhino (no white), elephant, lion, buffalo, hyena, and leopard as well as good colonies of hippo and crocodile in the shallows. As well as the more usual antelope you have a good chance of seeing the majestic roan and my personal favourites, the gleaming sable. Around 240 species of bird can be found in the area. 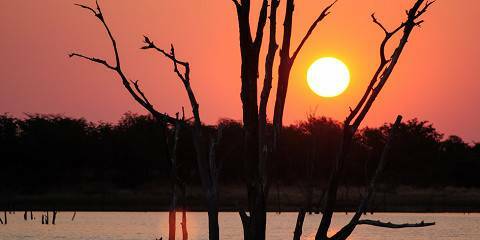 I really like this wildlife-rich park on the fringe of the enormous Lake Kariba with my favourite activity being the sundowner boat cruises to view animals coming down for a late afternoon drink. Most tourist activity concentrates on the lakeshore area and there is good reason for this. During the dry season, this lush-green, grassy shoreline attracts hungry herbivores in their thousands; the large lion prides are never too far behind. I am also a big fan of spending a week on a houseboat and slowly puttering along the Matusadona shoreline where, more than once, I’ve been treated to the incredible sight of a growling and snarling pride of lions noisily gorging themselves on a downed buffalo that they ambushed the night before. A wide range of comfortable lodges on the surrounding islands and mainland offer visitors a chance to explore the park by boat, canoe, or on foot. For an off-the-beaten-track wilderness experiences second to none, I can highly recommend hiring an experienced walking guide to take you on a multi-day walking safari deep into the park thereby allowing you to access the wild, hilly areas where almost nobody ever sets foot. This is a true wilderness experience in Big Five country. The inland sea, Lake Kariba, forms the northern boundary of Matusadona so you can combine your game viewing with fishing and boating trips. As lake levels rise and fall the shoreline provides excellent grazing for buffalo and antelope so these in turn attract good populations of lion, leopard and hyena. 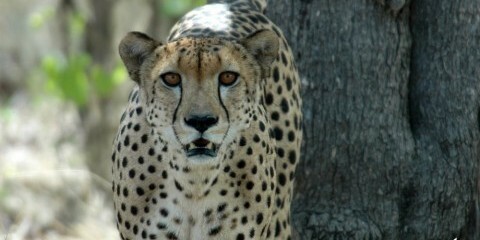 On a couple of occasions I’ve also been privileged to see cheetah. Large herds of elephant (hence the charming Shona name) use the lake for drinking, cooling off and recreation and there is a small population of black rhino patrolling the base of the escarpment. This of course means Matusadona is a Big Five park, complete with crocs all along the shoreline. Its location means this magnificent park is little visited making it one of my favourite wilderness destinations. The sunsets on the lake with its skeleton trees in silhouette are beyond beautiful. Stay in one of the superb safari camps or on a houseboat. Preferably both! Matusadona is in a beautiful setting on Lake Kariba with numerous islands, fertile floodplains, and a majestic wall of mountains as a backdrop. Most people stay at the lakeside lodges or visit the park’s shoreline from a houseboat. These have galleys where cooks provide meals, neat cabins, and perhaps a swimming cage that is lowered into the lake. The decks provide a perfect vantage-point for game-viewing. I’ve peacefully watched large herds of elephant, buffalo, zebra, impala and waterbuck feed on the nutritious grasses on the shore, plenty of hippo and crocodile in the shallows, and fish eagle perched on the half-submerged trees that jut out of the lake. Sleeping while moored on the shoreline is thrilling, and is accompanied by a chorus of night-time sounds like nightjars and owls, and I’ve even heard lion padding around; seemingly just a few metres away from my cabin. Many people might quake at the thought of a bushwalk in big cat country. But if the prospect appeals, Matusadona is an excellent choice. On my visit it didn’t disappoint. This beautiful, wildlife-rich park, considered one of Africa’s best places for lion-watching, can be explored in the company of an expert walking safari guide who will point out tracks and, if you’re lucky, the cats that made them. To add to the sense of impending drama, there are black rhinos here, and plenty of elephants. Lying on the southern bank of Lake Kariba, Matusadona is also a good place for waterborne adventures. Setting out by boat or canoe, you may encounter two of Africa’s fiercest freshwater predators – crocodiles and tigerfish – along with one of its tastiest, bream. A good scattering of comfortable but unfussy lodges seal the park’s popularity. Matusadona is a Big Five park, although you’ll be lucky to see the last remaining black rhinos, and even the lions have declined of late. But never mind: elephant and buffalo are common and its remote situation between Lake Kariba and the Matuzuiadonha Hills is stunning. The closer you get to the 700m summits, the wilder and woollier it gets, with walking the only real option. By far the easiest way to experience the magic of Matusadona is by water, cruising along the lakeshore into the mouth of the Gache Gache, the river that forms the park’s eastern boundary. To explore its serpentine channels is to be engulfed in a sunlit silence of reed beds and water lilies, broken only by the yelping cries of fish eagles. Wherever you look there is life: crocodiles basking with jaws agape, buffalo browsing on the torpedo grass, shy bushbuck watching from the shadows and herons stalking through the reeds. In places, long-dead trees rise from the water. Drowned when Kariba was created in the 1950s, their skeletal superstructures provide ideal perches for cormorants and kingfishers. For a longer stay, Bumi Hills Safari Lodge, Musango Safari Camp and the small, upmarket Changa Safari Camp are among the best options. 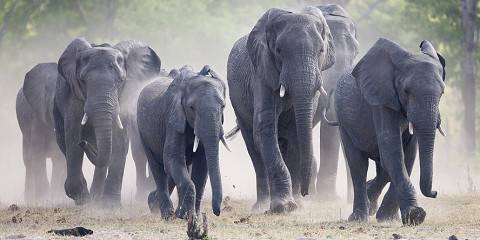 On game drives, bumping down red dirt roads in open Land-Cruisers, you drive through mopane woodlands coppiced to orchard height by the park’s 2000 elephants, keeping an eye open for leopards and hyenas, not to mention some 350 bird species. In April, Amur falcons, on migration from faraway Russia, hunt dragonflies along shorelines graced by big herds of impala and sudden flurries of egrets that stand out like snowflakes against the indigo lake.